Your stay is for a maximum of 90 days. Your visit is for business, pleasure or medical treatment. You have a valid passport issued by a participating country and are a citizen of that country (not just a resident). Your passport must usually be valid for at least six months beyond your expected stay in the US. Passports issued on or after October 26, 2005 must be machine readable, i.e. have a strip of standardized characters on the main photograph page. Should you be entering the United States of America by air or sea, you must have a return ticket, OR an onward non-transferable ticket for your destination outside the U.S. This must have been issued by a participating carrier (most major airlines and shipping lines). This ticket must be non-refundable except in the country of issue (or your own home country). If you are traveling to certain countries such as Mexico or Canada then you must be legal permanent residences if your ticket terminates in those countries. Furthermore, you are not usually permitted entry using the VWP if you wish to enter the United States of America on a private or official aircraft or vessel or by other non-VWP approved carriers. NOTES: Some travellers may be ineligible to enter the US under the VWP, including those who have been arrested, even if the arrest didn’t result in a criminal conviction; those with criminal records; people with certain serious communicable illnesses; those who have been refused admission into or have been deported from the US; and those who have previously overstayed a visit to the US on the VWP. 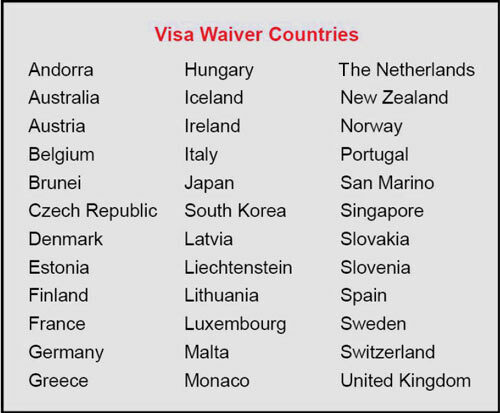 Since January 12th, 2009, ESTA (Electronic System for Travel Authorization) approval has been required prior to travel to the United States under the Visa Waiver Program. If you feel that you may be excludable from the United States VWP, or that you require more information on how it functions, it is highly advisable to have a consultation with a U.S. immigration lawyer in order to receive competent legal advice. Our attorneys have significant expertise in preparing applications for waivers of excludability. Therefore if you feel that you might require one then please contact us in order to book a confidential legal consultation with our USA Immigration Attorney.